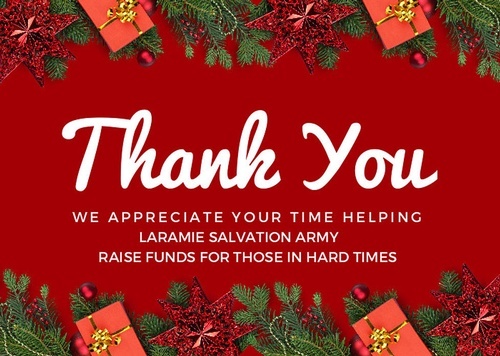 In appreciation of all the 2018 Bell Ringers, the Laramie Salvation Army would like to invite all Bell Ringers to a Volunteer Appreciation Party. Please join us Friday, February 8th at 5:15 in the lower level of St. Matthew's Episcopal Church. Appetizers are being served by teh Laramie Soup Kitchen with food donated by local restaurants. Please sign up by clicking here.